* Distance between top shelf and middle shelf: 15"
* Distance between bottom shelf and middle shelf: 16.9"
Versatile & sturdy mobile laptop or desktop computer workstation for stand-up applications. 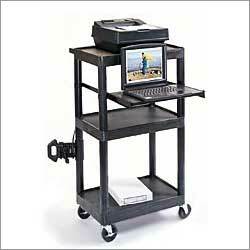 This black computer cart is an ideal stand up station for school classrooms, health care, industries, etc... The C LT45 cart includes an adjustable keyboard shelf, surge electric and 4" casters, 2 of them with locking brake. - 3" outlet, 15' surge suppressing electric (UL & CSA listed). - Molded shelves and legs will not scratch, dent or rust. Please select your version via the drop down menu on the left, when placing the order.